At the end of a tense interrogation scene between hotshot district attorney Willy Beachum (Ryan Gosling) and defendant Ted Crawford (Anthony Hopkins), the accused killer recounts an afternoon spent on his grandfather's farm. His job was to separate the flawless eggs from those with cracks or defects. But he ended up finding faults in nearly every egg he examined, and in the process discovered what would become a life-long obsession with imperfection. His adult life is spent detecting similar blemishes in highly intricate creations - from airplanes to labyrinth toys - and this craving for weakness becomes his greatest asset in the courtroom. His opponent during the murder trial is a man who thrives on a seemingly opposite philosophy - that of his own perceived invincibility. He's a lawyer with a 97% conviction rate and on a fast track to the top of the legal profession. He has abundant charm, and seems capable of bedding any woman he wants. Yet when he goes t�te-�-t�te with the villain, we find his game isn't that far from his rival's. Beachum, like the defendant, makes a living insidiously probing people for cracks and defects in their stories and character, and at the same time Crawford is as arrogant as the apparently flawless lawyer before him. Both characters must come to terms with their own imperfection before they can beat one another. In this way the film seeks to stress the individuality of life - the necessary "flaws" which make us each uniquely human. Yet Fracture makes too many of its own mistakes in developing this theme, the biggest of which is ironically its lack of individuality. The plot is predictable and the characters, outside of the two leads, are flatly drawn. Take the performances of Gosling and Hopkins out of the picture and you've got a very pedestrian courtroom "thriller." Of course you can't separate the film from the formidable presence of the two actors at its center. In fact Gosling's charismatic intensity and Hopkins' sinister allure make it easy to overlook the major plot holes and improbabilities of the narrative. Instead we are invited to sit back and enjoy the glossy entertainment packaged before us. There are a few clever shots and memorable sets, not to mention a couple choice luxury cars (Beachum drives a classic BMW while Crawford roles in a sleeker model). But for the most part the director leaves interference to a minimal, letting his stars dominate the screen. Hopkins has long been at the top, but Gosling, at the age of 27, is already among the few actors in Hollywood who can carry a film based solely on the weight of his charm. Watching these two navigate a scene together is a thing of beauty. In particular Gosling shows a talent for deftly picking his spots, deferring to Hopkins for a stretch before employing a subtle tick or a cautious smirk that steals a scene. One almost wishes they had forgotten the nagging plot altogether and simply written more pages of interrogation between prosecutor and defendant. Nevertheless, we'll take what we can get. 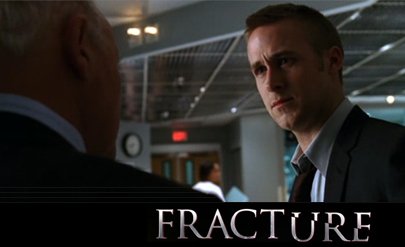 In this case, the heaps of faults are worth wading through to witness the perfection of Gosling v Hopkins.